You know what makes my kids happy? Being outside. It doesn't much matter what they're doing - they always find some adventure. 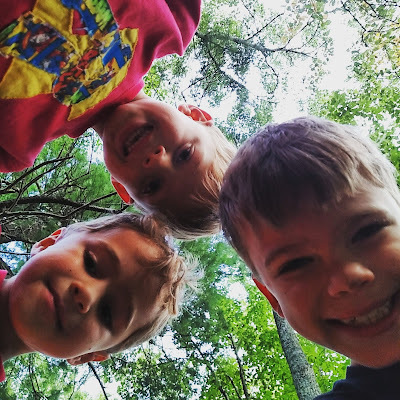 And while they may still chat about Minecraft, while running and leaping and climbing, at least they are soaking in the great outdoors and having fun along the way. Readers, have you ventured outside lately? my boys love the outdoors too! such happy faces in this pic - much cuteness here! Not sure I've mentioned it in a while but ya'll are great parents to those boys! Hum, maybe I need to move my elliptical outside for variety...I'm spending a lot of time on that thing. After our long period of rain and mud, they were probably running out the door when the sun came out. I need to - soon! But my kiddo needs to, too. A lot more. The rain here for like two weeks slowed us down!! I venture out every morning to feed, turn out and muck. I breathe in the fresh air and feel lucky to have the ability to do so, instead of an office where I spent far too much time in my young years. love this! so glad you live where you do and they have 'free range' living! Not enough, Lisa. But the boys look happy and it's enjoyable to see them having fun! Have a nice weekend!! lol on the Minecraft comment. My son talks about it with his friends too when he's outside playing. It seems to be a universal kid language. ;) That's a great picture! Yes, getting ready to go to a festival today! Isaak loves it outside. I have to push Mica out there. I don't know what his problem is. I loved being outdoors when I was a kid! We have a rule where the kids have to play outside for a bit everyday (weather permitting) before they turn on any electronics. THEY LOOK REALLY HAPPY ALL THE TIME. I think our boys would be good friends. My son loves the great outdoors too, and thankfully, he will choose it over Minecraft any day. Of course, enjoying the great outdoors while talking about Minecraft would be #1 on his list. I remember my boys loved being outdoors! I walk on the beach almost every day, collecting sea shells and taking photographs of the sunrise or sunset or just anything that strikes my fancy. :) I'm really enjoying living on Chesapeake Bay. When I was a kid, I liked being outside too.